If you are wondering when your settlement is due or if you have been settled or not and how much you were settled. Rave provides a view for you to see all this information at a glance. 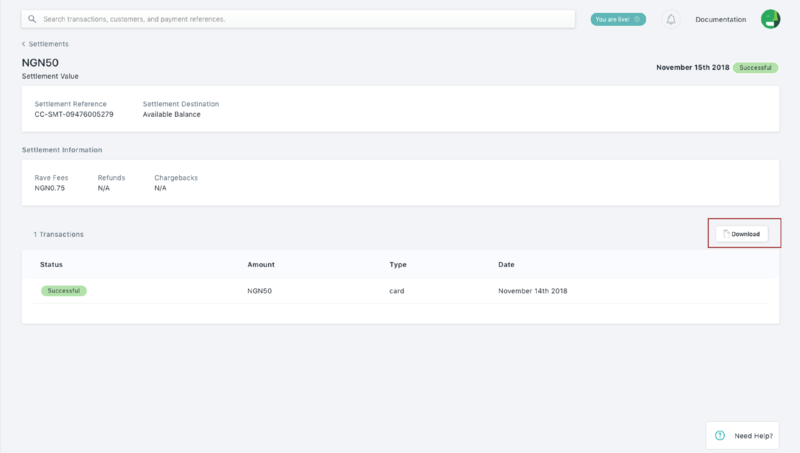 Switching to the settlement tab, shows a paginated view of all settlements processed to you, at a glance you can see when the settlement is due under the `Date Settled` tab, view the status of the settlement and the destination. Your settlement can have 3 possible statuses, successful, pending or flagged. We are going to explain what each status means below. Successful: This means the settlement has been successfully processed into your selected destination i.e. Bank account or Available balance. Pending: This usually means your settlement is not due yet because of your settlement schedule you can see the due date by looking at Date settled tab. Flagged: This means your settlement has been delayed for processing due to particular restrictions, to see why a settlement has been flagged on your account, click on the settlement and the reason would be in the detailed view. See the screenshot below for an example. You can also see a detailed breakdown of the transactions, and fees taken which make up your settlement. Just click on the settlement you would like to view a breakdown for and on the detailed page, you would see all transactions that make up the settlement. There would also be a download button that allows you to download the transactions.